The weather is slowly, but ever-so-thankfully, turning agreeable. After the ungodly winter, with its record-breaking snowfall, the lengthening days and warmer air are truly liberating. Just like the weather, so too has the business community in Washington Depot brightened. The recent arrival of Best Monogram, in a small storefront on Titus Road, brings with it the kind of cozy warmth that’s been missing for too long. It’s quite the juxtaposition, compared to the cracked and dampened Depot exterior left in the wake of this dreadful winter—when stepping inside this boutique of customized gifts and accessories, visitors find a store teeming with brilliant colors and soft, comfortable fabrics. This is the place for pink cotton bathrobes, smooth scarves that come in various shades of red and yellow and blue and purple, and towels that seem to incorporate the entire color palette. This is the place where one finds, sitting atop the back shelves, a row of smiling, adorable and extra-cuddly stuffed animals; baby blue bears and bashful bunnies. But what makes Best Monogram different from the typical gift shop, as the name of the store intimates, is owner Amy Torosyan’s ability to personalize essentially anything, certainly anything within her store, with a stitched monogram or pattern. 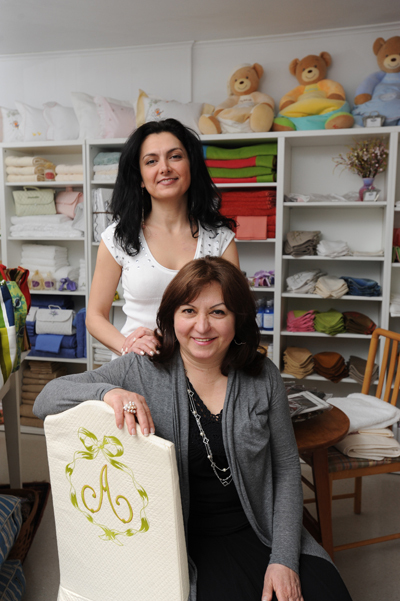 She can personalize tablecloths, those cute stuffed animals, handbags, shirts and much more. Even the type of fabric presents no major obstacle. Pashmina fabric is a fitting example. She knows how to work with that very fine type of cashmere wool, which is quite a feat, as less experienced craftsmen might ruin a pashmina scarf when forcing upon it some ham-handed monogram. She escaped the oppressive Soviet power in 1977 and went to California, not knowing a word of English. Eventually she made it to Connecticut, where she raised her family and grew her status in the fabrics and linens line. But in Armenia, when she learned how the art of tailoring, those were the days when it was vital for someone in the field to knit, crochet and stitch everything by hand. And that’s a skill she possesses, but today Ms. Torosyan boasts the best embroidery machine in the industry, one that’s computerized and able to digitize designs and convert them into an adaptable pattern. It seems there is little in this regard she can’t do. She can monogram a lampshade, if someone were so inclined, and create her own designs, and she has at her disposal basically every color and shade available. That best machine in the industry, which is actually in a remote shop she runs in New Milford, can produce thousands of designs. And the software can produce as many as 250 different fonts. It’s not unlike Microsoft Word in that way, as Ms. Torosyan can monogram a handkerchief in Times New Roman, Century, or more fanciful scripts. It’s capable of handling type from one-half inch to 18 inches, and of crafting a pretty horse’s head, as she once did on a gift for a 9-year-old girl who happened to be in love with equines. Ms. Thor said those are the kinds of touches that makes a gift that much more special. “Like with baby blankets, it makes it seem like you took the extra time, like you took the extra care,” she said. Best Monogram, in the onetime home of Vanitas Jewelry, opened its doors at the beginning of February, back when the awful winter was still relentlessly dropping snow almost daily on small communities. The weather postponed any big opening, but that was OK, as it provided time to settle in and perfect the decor. She did a good job. It’s a cozy space, and so is the merchandise. Ms. Torosyan always worked in the fashion industry, and she has had her own workshop in New Milford for a few years. But this is her first actual storefront, and given the dearth of such stores in the area, when the opportunity presented itself she knew to put her initials on it. That’s true, as boutique and homey and quaint the businesses tend to be in the town’s center, it’s curious that there was previously no independent linens store. But now there’s Best Monogram, stitched into the community. Best Monogram is open from 11 a.m. to 5 p.m. on Tuesday, Friday, and Saturday. For more information, the shop can be reached at 860-868-7707.